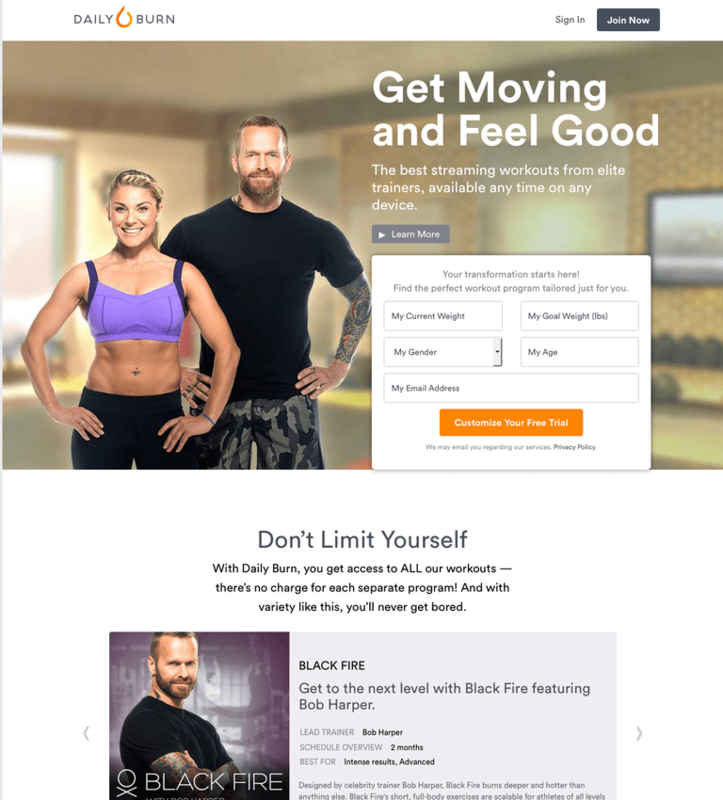 The most recognizable of those trainers is Bob Harper, of The Biggest Loser fame and, for $19.95 a month, you get unlimited access to his and other programs, all available on just about any device you can imagine—your smartphone, tablet, computer or TV. You also have the ability to let Daily Burn choose a workout program that fits you best. Daily Burn used to be a big, complicated tracking website with everything from meal tracking to workouts to calendars and more. They've really streamlined it down so that it's basically more about workouts than anything else. When you sign up, you can get a 30-day free trial, which is a nice feature, and, as you fill out your profile information, you have the option of letting Daily Burn choose a program for you. For example, if you say you're advanced and you want 60-minute workouts, they will probably recommend Bob Harper's program, Black Fire. Once you sign up for a program you get a week's worth of workouts and a suggested daily meal plan—this includes some recipes, but no real calorie counts or nutrient breakdowns. Using Daily Burn is easy. You can do it on your computer, Apple TV, Roku, your smartphone or tablet, and just about any other gadget out there that connects to your TV and lets you watch stuff. The real meat of Daily Burn is its huge variety of programs. Rather than offering a list of workouts (which, frankly, would also be nice), everything is packaged into programs lasting from 2 weeks to up to 8 weeks. They have some obviously killer programs, if the names are any indication—Inferno, Live to Fail and Bob's Black Fire, to name a few. They do have one program specifically for beginners that I really like. It's very well thought out, taking very beginners through different phases of fitness, starting with mobility and stability and working your way up to more strenuous workouts. Every program comes with its own nutritional focus. For example, beginners focus more on creating healthy habits, eating breakfast every day, eating more vegetables, mindful eating, etc. They offer daily meal plans, but they also give you lots of options to choose from to make your own meals. Slick, Clean Interface - We love the look of the site and the fact that the pages aren't cluttered with too many links, ads. or information. It's hard to find fault with Daily Burn. The layout of the site is good, the workouts are good, and the programs are helpful. If there's one thing we want from the site, it would be the ability to do any workout from any program. Once you choose a program (or it's chosen for you), the only way to access other workouts is to change your program. Overall, Daily Burn is a great choice for people who want a structured program to follow and there are such a wide variety of workouts, instructors , and programs, almost anyone could find something that works for them.